When you want to fully praise the retiree, personalized retirement gifts are undoubtedly the best way to go. Rewarding a LIFETIME of commitment requires some recognition and acknowledgement, and this Captured Wish puts the right spin on the transition of that reward. Transition indeed. The new life that opens up to a retiree can be looked upon as a whole new adventure - throw good thoughts into the mix and some extra wishes and you've got Captured Wishes just for them! Our Retirement Congrats Captured Wish is a truly unique and special way to send off your colleague, or to congratulate your friend or family member. Each vessel we create is made by hand so each one is different. In fact, they are so different you can be certain that no one else will think of giving a gift like this! This is a complete package - a gift, a gift box, and a card. Ready to gift! Personalized retirement gifts like this can only be found here! This beautiful Captured Wish (height approx 30mm x 15mm width) is a great way to express your combination of happiness for the person whose life is moving on to the next stage, and possibly melancholy at the knowledge that you won't be working together again. 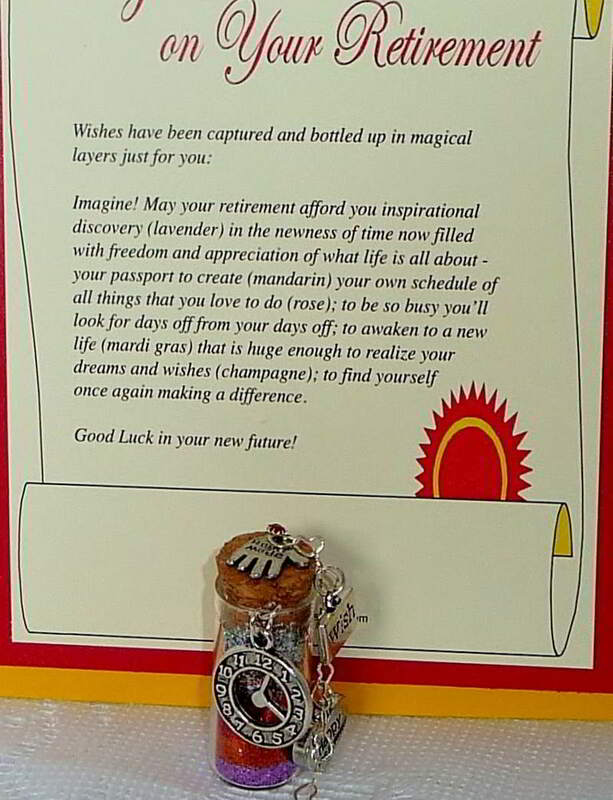 Whether it's for a colleague/friend or relative or just a personal friend, giving this little vial of wishes will certainly delight the receiver....who doesn't have expectations and wishes for the start of a new journey in life? Retirement Wishes: The Retirement Rap! Discover more Chic and Unique Retirement Gift Ideas!